We offer a wide range of string quartet instruments for children and adult players of all abilities. All instruments are serviced and brought up to their highest standard in our workshop. As each instrument has its own personality, we suggest you come around and try our violins, violas and cellos yourself. Please book an appointment so we will be available for you. It is important for us to provide the young musicians with the best available instruments. 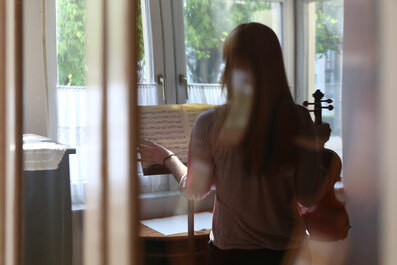 Rental rates starting at €25.- per month (only violins and violas). Our sound adjustment releases the full potential of these good value for money instruments. All instruments in this price range are made in Europe, usually in serial production. The price depends on the qualification of the maker and the amount of handcraft. More qualification and more handcraft lead to a higher price - and a better sound quality. We also offer antique violins, violas ans cellos made in serial production. New violins, violas and cellos within this price range are handcrafted in all parts essential to produce a high quality sound. Antique instruments are beautifully made, but can not be linked to a certain violin maker. We make violins, violas and cellos to the highest standards. Our instruments are played by professions and dedicated amateur players all over Europe. We also love to make baroque instruments with great sound and beautiful decorations. Student baroque instruments on request.